I went to eat at the recently opened O Pedro restaurant in Mumbai and realised that my meal there was accompanied by the memories of my earlier Goan food encounters. This post is about that realisation! I went Colaba's New Martin Hotel a few weeks back to meet a British Indian food writer and author friend of ours, Meera Sodha. She had suggested the venue to me and I readily agreed though it was a bit of a drive from my home. I love the place you see. I broke into a smile the moment I entered Martin's. This tiny little Goan restaurant in South Mumbai holds so many memories for me, especially of my early days in Mumbai and of my dating days with K before we got married. The waiter at New Martin’s welcomed me with a smile and said, "we haven't seen you for so long." He looked exactly the same as when I first saw him in 1999. The restaurant looked the same too! As did the plates of Goan sausage chilli fry, the pork vindaloo and the beef steak fry with chips and onion that I ordered. Dishes that K and I would always order when we used to come here at the turn of the century. You don't get to choose the level of done-ness in the 'steak' at New Martin. It's a piece of buff (water buffalo) meat which is deep fried and served I guess. It is proudly plated in a pool of oil and fat with a pile of fried onions and chips to give company and a piece of tomato for vitamin C. I've never come across this dish anywhere else, though chips have appeared with every chilli fry that we have ever ordered in Goa too. The pav that we ordered at New Martin’s the other day reminded me of those good old days when we were trainees. Ordering each extra pav then was a momentous decision as it would add an extra five rupees to the bill! This is Mumbai of course and hence they serve pao here and not the poiee of Goa. Eat local, as they say. I would love to tell you that the food at Martin's has remained the same over the years, but that would not be entirely true. The flavours of what I had the other day were indeed the way I remembered from a million meals at Martin’s, eaten primarly at the restaurant, and some as takeaways after we were married, which I would bring back home for K when I went to Colaba on work. However, something was different this time. The quality and texture of the meat in each of the three dishes, the sausage, the vindaloo and the steak, were all better than before. Each was a lot more tender than before. I commented on this to the waiter at the end of the meal and while I packed some prawn curry to take for K's aunt, Perin aunty. He smiled back at me bashfully and said that they have changed their meat supplier and that this could explain it. As I stepped out of Martin's that afternoon, the penny suddenly dropped on something that I'd been mulling with for a bit. About why I felt a sense of confusion when I went to a restaurant called O Pedro in Mumbai during the same period as my recent Martin's visit. I went to O Pedro not once, but twice, to investigate this. Coincidentally the first time was with good old Meera with whom I had gone to New Martin's this time. The Goans called this sousegad. I am sure that the cats do too! For those who didn't know this, O Pedro is a fairly new restaurant opened at Mumbai's BKC precinct. It is the brainchild of the US based Indian chef, Floyd Cardoz. A Goan himself who has among other things, earlier brought us the runaway hit, The Bombay Canteen, in Mumbai. From whatever I gathered from the many media and social media reports on O Pedro. This is a project born out of his love for Goa and Goan food. Chef Floyd’s tribute to his roots. A few Goans whom I know of, had gone to O’Pedro and tweeted/ posted about loving it. I was keen to find out how it was. My first visit to O Pedro left me confused as I said earlier. Perhaps 'intrigued' is a better word to use. This was not the Goan food that I knew of. Of course, by now I have hopefully ‘grown up’ enough to know that having had a few meals cooked by Goans in Mumbai and in Panjim, a few more meals had in restaurants and hotels in Goa, and at the two and a half Goan restaurants in Mumbai, was not enough to claim that one is an an 'expert' at Goan food. I am far from that in reality but I did love whatever I have had of Goan food so far. Coming back to O Pedro, its head chef in Mumbai, Chef Hussain, explained to me on my second visit to the restaurant that the food at O Pedrois a mix of Goan inspired food, food that follows the Goan imprint across the world (the Portuguese influence) and some classical Goan dishes too which the chefs here have not tinkered with according to hime. The terms that he used were slightly different from what I have written here. His explanation reminded me of a post that I had written at the end of last year about how difficult it is to define 'Indian restaurants' today, especially with regional gems coming up across the country and with local chefs travelling the world and infusing their sensibilities into the dishes the create. You could say that my experience at O Pedro did not confirm to my what my expectations from a conventional Goan restaurant. I was trapped in my Goan museum of memories. My first visit to O Pedro was during dinner time on a week day. The place was packed at 8.30 pm which is when we arrived. We had made a reservation prior to coming. The décor as we observed was beautiful and spoke of thoughtful detailing. The overall ambience, very recreated sepia and felt like what a Portuguese bungalow in Goan would be like. A world far removed from the humble world of Martin's. It was very noisy though at O Pedro that evening, partly because of the buzz of conversation, but largely because of the music. This was disconcerting as we had thought that O Pedro was a restaurant which serves cocktails too and not a bar and therefore had hoped that it would be a bit more serene. Conducting a conversation was tough that evening. This was was sad as the idea was for K and me to catch up with Meera over a nice meal. It was also sad as the waiting staff at O Pedro was very enthusiastic and well versed with the menu and were quite eager to explain the long menu. However, one gave up trying to understand what they were saying after a while and just ordered and hoped for the best. A far cry from its sister concern, The Bombay Canteen, where I went a few evenings back and faced no such noise issues. We had gone with K’s family at Soda Bottle Opener Wala one Sunday evening and again the noise came in the way. Something for their restaurant owners to look at. young, cheerful, enthusiastic and know their stuff which is great . These gentlemen are from Bombay Canteen though. What makes ordering your food even more difficult at O Pedro is the array of dishes on offer. It's a long long menu unlike traditional Goan places which barely offer 5 or 6 Goan dishes. The food at O Pedro comes in various portion sizes. The staff does urge you to try a variety and yet at the end you realise that your bill is not as much as you thought it would be as many of these are small plates. Tell us about the food! Let me tell you about what I really liked during our first meal at O Pedro. We all loved 'Aunty Castro's fish mousse' which served in a tin can. The can was a tribute to Portugal's love for canned fish chef Hussein told me when he suggested that I order it. I later saw canned fish were indeed popular there in the Lisbon episode of 'Somebody Feed Phil.' The mousse at O’Pedro was soft and creamy and a true flavour bomb. The tomato confit added to it a bewitching tanginess to balance the fishy flavours and the seasoning was perfect too and it was bathed in good olive oil. This was a truly exquisite dish. The other dish that we absolutely loved was the veal tongue prosciutto. While we have had lovely ox-tongue roasts at Infantaria at Goa in the past, we have never had tongue as a cured meat before. The texture of the prosciutto at O Pedro was just amazing and the cushiony meat did a little happy jig in one's mouth. 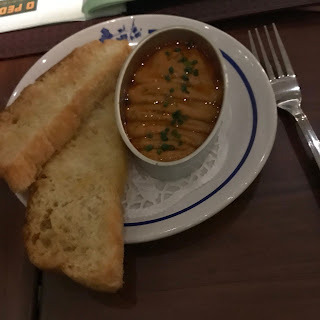 The garlic butter emulsion served with it cut the meatiness of the dish and added a bit of freshness between the bites. The spicy garlic prawns that we had that night which reminded me partly of the butter garlic prawns of the Mangalorean restaurants of Mumbai and partly of the gambas pil pil of Catalonia. This is another solid bet at O’Pedro and was pure prawnography on a plate. The prawns were juicy and not overcooked and with just the right hit of spices to pump them up a wee bit. The stuffed squid dish that we ordered was pretty nice too. The squids were kept whole and the texture wasn't too chewy. A sign of admirable cheffing prowess in the kitchen. The robust spicing added a life to the dish. There were some dishes that we didn't think much of. The raw papaya kismur for example and then the crispy pork chicharones, which here was more about the crackling it seemed than meat. Different from the cubed pork belly that Meera and I had had at her favourite tapas bar in London a few years back. The sourdough poiee that we ordered at O Pedro was a lot chewier than what had in Goa a few weeks later which were regular poi of course. I recently had poi that tasted like leather at Mumbai's Goa Portuguesa which made me feel that perhaps poi is perhaps best left to the poders (bakers) of the villages of Goa. There were a couple of dishes at O Pedro that left me a bit perplexed when I compared them with what I had expected to be. One was the smoked pork ribs vindaloo. The slow cooked pork was indeed very tender but the spice palate of the dish here was a lot sweeter than one associated with vindaloos one has had till date. The other dish that was not what I expected it to be at O Pedro was the duck feijoada. Feijoada is dish which has travelled from Portugal and Brazil to Goa from what I am given to understand. Each country has its own version I am told but as far as I know the dish is about beans with pork added to it and was once meant to feed plantations workers, slaves and was essentially poor man's food. At O Pedro, they turned the dish on its head and made it all about duck which showed the chef's culinary prowess no doubt but one could hardly see any whole beans in the dish. I use the word 'see', as the beans could have been mashed in. The dish was as unrecognisable a feijoada to me as is the eggs kejriwal at their sister concern, The Bombay Canteen, compared to the ones that I have at the RBYC in Mumbai. 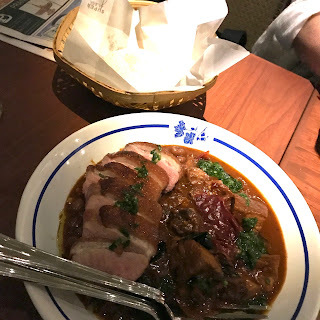 If you had the feijoada without any context then it was a good dish but I feel that the Syrian Christian duck curry that they do at Bombay Canteen, a very different preparation of course, but where the duck seems to be rendered in a similar way, is a much more memorable dish. Just as is the Chettinad aglio olio prawns that I had at the Bombay Canteen is compared to the butter garlic prawns at O Pedro. Two very different dishes of course but if there is one prawn dish I would recommend that you try, it would be the one at Bombay Canteen. The spices are more intricate there as are the prawn flavours rendered in by their adding in the heads of the prawns to infuse flavour to the oil. Why am I comparing two very different dishes from two different restaurants? Simply because as a customer that’s what I would do while deciding on where to go. We do not look at options in isolation after all. That's the thought behind conjoint analysis in market research after all. I did want to go back to O Pedro and try out the more 'conventional' Goan dishes. I got the opportunity to do soon after my first visit to the restaurant. I happened to be with my friend and fellow food writer, Rushina Munshaw Ghildiyal, in the vicinity of the restaurant on a Sunday afternoon and decided to go to O'Pedro for lunch once done with work. It was around 2.30 pm so we didn't have to wait for too long for a table and once I settled down I realised that O Pedro in the afternoon was rather different from what it is at night. It was not only more nice and bright and more cheerful and warm then, but the ambient noise was more restrained and Rush and I could talk in peace unlike what happened the night when Meera, K and I had come here at night. We started with the buff chilli fry that afternoon at O Pedro. The dish had the sharp punch of pounded green chillies which gave an unrestrained, rustic, Goa shack-like touch to it. The meat was a tad chewy too. This was more ‘earthy’ food, than refined food. I tried the fish curry (xodi) this time around. It’s called Aunty Beryl’s fish curry here. After chef Floyd’s mother and the recipe is hers I am told. The orange coloured, grated coconut based curry, with kokum berry (I am guessing) infused tanginess, reminded me of the Goan fish curry at Candies which a Goan friend of mine with a strong point on food dotes on as does my Parsi mother in law. The curry at O Pedro was a tad sweeter and thicker than at Candies. The fish used here was snapper fillets and in the best traditions of Goan curries that I have had in the past, the taste of the curry dominated the dish than that of the fish. There was no attempt here to change this concept, unlike in the feijoada where the duck and not the beans was the hero at O’Pedro. We had the curry with Goan red rice. The fish was juicy and not over cooked at all. The other dish that I had here was the Goan pork sorpotel with sannas, the rice flower based fermented idli like bread which is used to soak up the sauce. The pork bits of the sorpotel were juicy and tender the way they should be in a good sorpotel. Once again, as in the fish curry, the sorpotel was slightly sweeter and thicker than other sorpotels that I have had, the Goan as well as the east Indian ones. Rushina, who loved it, wondered if there was ketchup in it and the chef assured us that it wasn’t as even I was a bit baffled. To me, the sorpotel and fish curry at O Pedro seemed more like what one would expect in someone’s house than in a restaurant. Comforting but not too spicy, not something that challenges your taste-buds or digestion. I just realised that I have been writing this post over about three weeks now with travel and work coming in between. So I thought that I should sum up what I am trying to say here, using my O Pedro experience as the context. 2. It would be hard to define what is ‘authentic’ in any Indian cuisine and Goan food is no exception. A few days after my O Pedro meals, I ate once again at the Mahim neighbourhood favourite, Goa Portuguesa. The sorpotel there had more fire in its belly than that at O Pedro had and was more spicy too. The fish curry using surmai at Goa Portuguesa was thinner and stronger on coconut flavours. The issue of concluding on authenticity is further compounded by the fact that I am not Goan and hence trying to say how things ‘should be’ would be very foolish of me. What one can safely conclude is that O Pedro opens your mind to the world of Goan food beyond vindaloo and...well, vindaloo! 4. And finally, when it comes down to food, I would still maintain than it comes down first to the quality of what is cooked that makes or mars a meal for me. Take that fish mousse at O Pedro for example. That didn’t need any explanation or story once it was in your mouth to push it through. It was a sheer drama of brilliance from there on and won our hearts. This brings me to the question that I want to ask you, can you isolate a meal from the trappings around it? Are we ever alone when we sit down to eat or do we are memories give us company? Please write in and let me know what you feel on this and thanks for reading till the end. I am so happy to finally press on the 'publish' icon! With Meera Sodha at O Pedro. 1. Our first meal for 3 at O Pedro cost Rs 3,900 with no alcohol. The second for 2 cost Rs 1,800 with no alcohol. My meal at Goa Portuguese soon after came to about Rs 2,000 per head. There were 8 of us. We had alcohol and crabs too. The latter is always expensive.